The mid-summer stench from Epple Bay is drifting on the wind as far as Westbrook as are the flies that accompany the annual rotting of the seaweed deposited by the current each year. How the residents put up with it I don’t know and perhaps they simply become used to the smell. I see the graffiti artists have been active all the way to Minnis Bay from Westbrook over the last week or so since my last ride along to Reculver. For them, “Keep Thanet Beautiful”, is something that concerns other people but certainly not one car load of visitors who I watched throw a bag with the remains of their lunch out on to the cliff-top road past the golf course at Westgate. Evasive action was required on the narrow sea wall path that leads to Reculver. Twice in fact, as two kids on Mini-motorcycles hammered past me, touching at least 50mph I guessed, scattering the families on their afternoon walk as well. I watched one chap unload two quad bikes from his van in the car park behind the Minnis café, furtively scanning left and right before, his small son, in full body armour, was deposited in the cockpit of one, ready to launch himself with dad along the cliff top or the promenade and s**w anyone who might get in their way. Call me cynical, but there’s a whole micro-culture out there who don’t give a damn about regulations concerning mini-motorbikes, quad-bikes or even jetskis once summer is in full swing. They’ll do what they like and you know what, they know that they can carry on with impunity because the chances of being stopped or even caught are virtually nil along our coast. Sure, these are not big crimes in the scheme of things but in the States, I recall that when I lived and worked there years ago, the small seaside towns had a zero tolerance approach to low-level anti-social behaviour because they knew that by coming down hard on small offences, they could invariably discourage anything more ambitious. Otherwise, it’s been another scorching weekend and looks as if it’s going to carry on for another week at least. 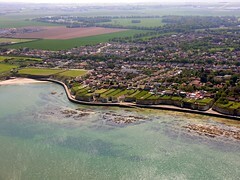 Leaving aside the nuisance factor of a small minority, Thanet, while it might not be the Cote D’Azur, isn’t far off it in temperature and appearance and it certainly has more beach BBQ’s going at this time I’m sure! Talking of BBQ's has anyone noticed that the remains of a friday night cookout is still laying on viking bay beach. Despite telling the so called beach cleaners several times it was still there at 6 pm on sunday. Most people do use the bins BUT on saturday there was no cleaners from 10 in the morning and the bins had still not been emptied when i left at 8 in the evening. timed photo's were taken and have been sent to the council. Yes, I saw the graffiti along the prom too. The footbridge at the bottom of Albion Road has also been re-daubed despite being re-painted by the Council (one presumes)during last week. All this happens within the first week of school holidays! Great, there's another 6 weeks to go!!!! We always BBQ on the beach, in the evening at the chalet when the beach is almost epmty and take our mess with us. That was until we were told the other day that it is now an offence to have a BBQ on the beach. Too much moderation in the places it doesn't matter. Not enough in others. I pay nearly £200 council tax per month - living in Epple Bay - but I am unable to walk my children to my local beach because of the filth and seaweed - and the council does not want to know - because I am paying for Minnis bay, Broadstairs and Margates blue flags!!! Hope he caught some, as the graffiti was plentiful again! If the TDC cannot be bovvered with doing their costly cleaning work, (we pay when we pay CTax)how about getting a watch dog group going? I often get bills for 'work done', and on checking discover some stuff that just hasn't been touched. I knock this 'done' work OFF the bill, then pay. If they want to argue, I have photographic evidence to show up the truth. Any other problems are sorted in Court. I still find the doggy poo annoying. OK, a lot of owners collect it in bags, but then you see the bags strewn in the grassy coves and niches. I like dogs, but I don't like their (sometimes)stupid careless beligerent owners. Double or treble the fines until this practice stops. Those bloody mini motorbikes should be illegal. They are a menace. They are if riding on public roads, parks or other land which isnt privately owned and without consent of the said owner. It is not just the Mini motorbikes and Quad bikes that are a menace on the promenade. There are increasing numbers of people driving their cars illegally along the waterfront at Palm Bay in particular, I have seen one irresponsible driver with a young child on her lap, the child steering the car whilst the adult uses the foot pedals!! And they can see nothing wrong with it! There are also the large groups of visitors, usually of foreign origin who come down to Palm Bay "en- mass" park all over the prom. When they have gone the beach is left in a disgusting state with rubbish they are obviuosly too tired to take home! !